BEDE the YOUNGER, a high-ranking courtier in the Court of King Charles the Bald (r. 843–877), who left the world and received monastic tonsure at a monastery in Gavello, approximately 60 km / 37 mi southwest of Venice. Several times St. Bede was offered a bishopric, and each time he refused. St. Bede reposed in 883. BEOCCA, ETHOR, and COMPANIONS, the sack of England, and in particular the monasteries, by the Danes claimed many lives including SS. Hedda, Theodore and Companions (9th April). To the number of martyrs, we must add SS. Beocca, Abbot; Ethor, priest-monk; and some ninety monks at Chertsey in Surrey in 869. MACARIUS of ANTIOCH, an Archbishop of Antioch who resigned his See, and following a pilgrimage to the Holy Land, set off to enlighten pagans in the west. He travelled north through Dalmatia and Bavaria, preaching the Gospel and earning a reputation as a wonderworker along the way. St. Macarius finally settled in Ghent in present-day Belgium at the Abbey of St. Bavo (Sint-Baafsabdij). Where he remained for the rest of his life, reposing in 1012. MARTYRS of OSTIA, a group of criminals who were baptised by Pope St. Alexander I (3rd May) during his imprisonment. They were martyred by drowning after being taken to Ostia near Rome and put on board a boat which was then sunk at sea circa 115. 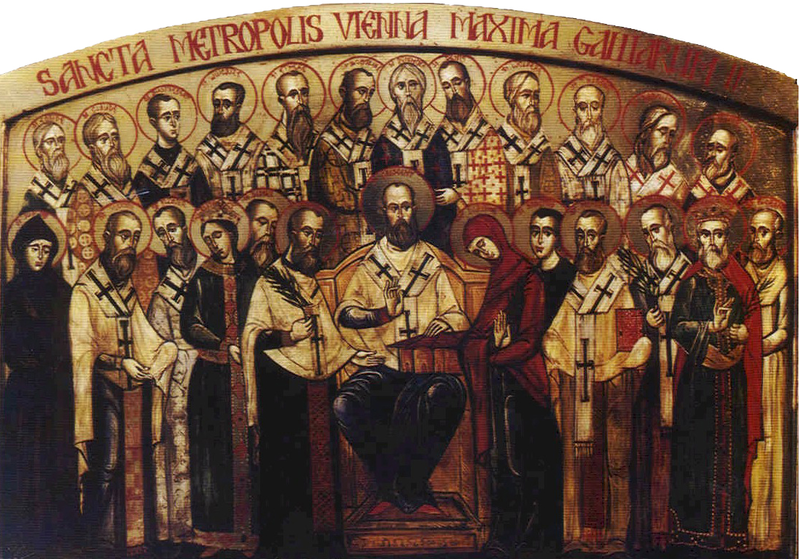 Some sources list them as Martyrs of Rome. PALLADIUS, an Abbot of the Abbey of St. Germanus of Auxerre (abbaye Saint-Germain d'Auxerre) in Burgundy (France), St. Palladius went on to serve as Bishop of Auxerre, and was the founder of several monasteries. He reposed in 661. TERENCE, AFRICANUS, POMPEIUS, and COMPANIONS, a group of fifty Christians who in 250, during the Decian Persecution, were tortured by imprisonment with snakes and scorpions, before being martyred by beheading in Carthage, Africa Proconsularis.